Are There Multiple Future 1st Round Picks on Notre Dame's Roster? It takes talent to win a national championship is an obvious, but true statement. All the evidence anyone would need for this would be to look at the last 15 programs who finished the season holding up a crystal football with confetti raining down on them. Alabama (five times). Clemson (twice). Florida (twice). Ohio State. Texas. USC. Florida State. LSU. Auburn. No underdogs there. Each one of them a blue blood program that had their roster filled with a majority of 4 and 5-star recruits. All of those programs who won a national championship have something else in common: they all had multiple future first round NFL Draft picks starting for them. 12 of the 15 national champions have had four or more of their starters become first round picks. Football may be the ultimate team game, but teams need difference makers. If a program wants to win, the last 15 years is proof that you’re not winning a championship without them. The 2018 Notre Dame team was very good, but in this upcoming NFL Draft they are currently projected to have no first round picks. There’s a chance Jerry Tillery makes it into the back end of the first, but that would still only be one. Perhaps there are more starters that stuck around who will go in the first round in future drafts, which leads into the question, does the 2019 team have multiple starters who have the potential to become first round picks? Let’s rundown a list of candidates. I’m throwing these two together because they both became starters for the first time last season and also showed the potential to be among the best at their position in college football. To do that they’ll have to make a less of a jump than they made last season, but it’s a jump nonetheless. Pass rushers are as like gold to NFL franchises and if these two go from good to great, they could be on their way to being first round picks. I wouldn’t expect Banks to leave after the 2019 season. This is more for down the road. Any start to a first round path for him would start this fall, though. He showed glimpses of being a dominating run blocker and his combination of size, athleticism, and power is rare. The production has to match the athleticism, but he’s someone who will tear up the NFL Combine when it’s his time to compete there. He’s a freak athlete for his size and the ball skills we’ve seen in practice indicate he can be special. Now he’ll have the opportunity in this next year or two to showcase his immense talent. Just like Okwara and Kareem, he took his game to a different level as a junior. He can still get better to be a more complete corner. If he does, then NFL scouts are going to fall in love with him because he should tick every box with his athletic testing. That’s not a long list of candidates, which goes to show how much certain guys will be counted on to play like top NFL prospects if Notre Dame is going to be a true national title contender. 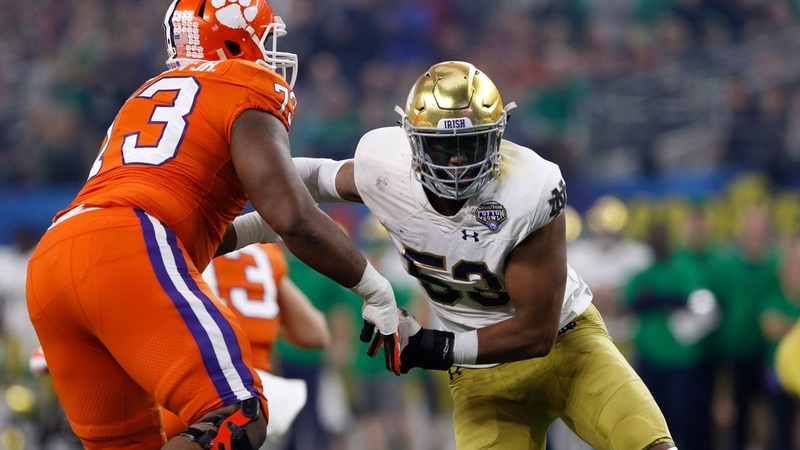 Maybe Notre Dame’s starting tackles, Liam Eichenberg and Robert Hainsey, put themselves in the conversation as first round picks down the road? Perhaps the muddled linebacker situation results in some future stars emerging with one or two of them having a shot later on? Jalen Elliott and Alohi Gilman could end up being one of the better starting safety duos in college football this year. No one would project them going in the top-32 picks right now, but maybe it will be different in 10 months. The most important part of all of this is development. The Irish don’t have an Alabama roster where the future first round picks flow like the salmon of Capistrano. There are no Jaylon Smith or Michael Floyd types on this team. It’s up the coaches, and strength and conditioning staff to develop them along with the individual putting in the work to get there. Until Notre Dame signs more of the Smiths and the Floyds, they have to put in a lot of work to get to where they need to with this. It’s not unheard of for them to do it. The 2015 team had four future first round picks that started on that squad (Ronnie Stanley, Will Fuller, Quenton Nelson, and Mike McGlinchey). It would have been five if Smith didn’t have his freak injury in the Fiesta Bowl. That team had too many flaws to win it all (depth and defensive coordinator at the top of the list), but they had the top talent that helped them be six points away from being undefeated in the regular season. Recent history suggests they won’t have a shot at winning a national championship if they don’t have more high-level NFL prospects like that 2015 team. We don’t know right now if the ‘19 version has that same kind of talent. No one on the roster is close to being a first round lock even with a good season ahead of them. Notre Dame has had more than one first round pick in a draft four times during the Brian Kelly era. That had not happened once since 1994, during the twilight of Lou Holtz’s run, so clearly Kelly is getting the program closer to that number one goal. Whether he achieves that goal will take more than having multiple first round picks on his roster, but without them he’s not going to be holding up that crystal football to end his season.